As part of our 40th birthday celebrations we’re delighted to launch the first of ten ‘40th lists’. Ranging from 40 films to holiday pearls, recipes to songs and music for the theatre classroom – this will be an insightful, useful and wonderful collection for all members of our community. We picked 40 websites to launch our lists and hope you enjoy reading and using the ideas below (just click on the title of each site to be taken to it!). Thank you to everyone who has contributed to our lists – a great indication of community involvement and spirit. This website has hundreds of talks to inspire you and was recommended by Sally Robertson who was introduced to the site by ISTA consultant Tommy Tonkins during one of their online meetings. A photo essay and website that explores the concept of living a life that focuses on adding more physical movement into our daily lives. This website was recommended by Sally Robertson who was introduced to it by ISTA member teacher and artist, Hannah Northcott. A website that is dedicated to different ideas to get kids making, moving and doing. This website includes videos, questions and new ideas designed to inspire curious young minds to create and use creative and design thinking skills. A free and top-rated meditation app that provide users with experiences such as guided meditation, music, courses, timers and you can connect to a global meditation community. ISTA artist and teacher, Hannah Northcott’s website dedicated to bringing mindfulness practices into the classroom through theatre exercises. This website was suggested by both ISTA’s Tom Scott and Carla Weiss. It is brilliant for theatre/event tickets in the USA and London, United Kingdom and users are guaranteed the best prices, especially when searching for last minute tickets. There is an iPhone and Android app as well. A theatre website that was recommended by ISTA teacher and artist, Lizzie Hodge who says it is “a brilliant resource which continues to expand its bank of videos of great stage performances, interviews with actors and directors and focuses on production, live theatre and also study guides for practitioners and playtexts.” A great resource for high school drama courses and ISTA is a Digital Theatre Plus partner too! A Youtube channel that has an excellent range of behind the scenes interviews with actors, designers, playwrights and directors. The first website offers an online catalogue for theatre books and other resources. The Vimeo page offers a fabulous archive of theatre teaching videos ready for use in classrooms. Everything from exploring qualities of movement, warm up exercises, fight choreography and more is available. A resource website for secondary school teachers, higher education educators and theatre professionals. 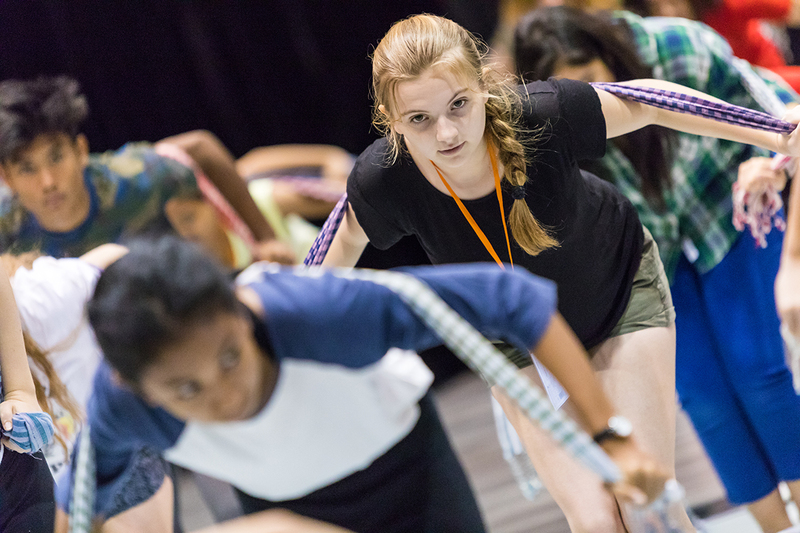 Downloadable resources to use in any classroom including education packs, playwright, actor and director resources and more. An online theatre blog that is filled with articles, ideas and a platform for theatre making discussions. A collection of blog posts relating to many aspects of theatre life, reviews for both onscreen and on the stage. A fun home to all things theatre that includes quizzes, blogs, teacher and student contributions, online forums and more. A great website for accessing playtexts, videos, audio work as well as critical studies and performance practices. ISTA teacher and artist Cath Rankin recommends this curated online depository of useful theatre resources for teachers. Also check out this item on the same website The Drama Teacher: Resources for Those Who Love Drama for even more resources. Recommended by Ian Pike, this nifty app is FREE and is an amazing resource for devising and ensemble work. Brings music creation to your fingertips! Another music resource recommended by Ian Pike that allows anyone to create their own music using iOS devices. Ever come across an online resource that you didn’t have time to explore but wanted to remember to look at it later? Pocket is a tool that allows you to keep online articles and websites in your online “pocket” for reading at a later date. A social media dashboard for your Twitter feeds that manages multiple accounts in one location. Tweetdeck allows users to organise and highlight certain feeds that they want to track and follow in a manageable system. A fabulous online tool that gets your various devices, apps and other programmes working together. Great suggestions on ways to make your life easier and make your devices work harder for you – so you don’t have to. Recommended by ISTA artist and staff member Keriann O’Rourke. An amazing resource in Chrome for extensions to add to your Chrome experience and add-ons for the Google suite. Browse the thousands of tools available from self-marking quizzes, to productivity enhancements at your fingertips to make your life effortless. Two great online collaboration tools that let you work collaboratively in an online environment. Great ways to connect and create virtual communities for discussions, sharing and helps to create virtual work environments to keep your team informed. A great to-do list app that helps to keep you and your family, friends or team organised. Have a million different passwords written down somewhere at your desk? Keep your passwords organised and on the go with this helpful password manager app. Make sharing a URL with others easier to type in by shortening the URL using these useful shortening tools. Flip your classroom by using EdPuzzle. This online tool allows you to share videos with your class and stop them at any point to ask questions and check for comprehension of the material. Tracks user completion and shares their answers with you so that teachers can see student understanding before the face-to-face lesson even begins. An online tool that uses video for reflection and responses within the classroom. A great tool to engage students in the materials, listen and respond to each other in a collaborative environment. Interactive screencasting tools that allows students and teachers to create reflection audio/visual comments, how to videos and explain their learning and understanding in a video format. Easily integrated with other programmes such as Google suite, Youtube and quickly shared. Create an online learning environment for students and teachers to easily contribute their ideas and share resources with each other. Quick to create, share and engage audiences. Let experts, professionals and celebrities lead you through masterclasses in a variety of subjects. From astronaut Chris Hadfield teaching science to Herbie Hancock teaching Jazz music; there is something for everyone. Three popular and easy to use website design sites perfect for artists wanting to create their own personal site, teachers online CV sites, blogs, businesses, events and more! A website and app dedicated to video storytelling. Stories delve into unique people, places and things that make our world a special place. Recommended by ISTA photographer, Paul Chapman of Noodle Photography. Take an online course from some of the top universities around the globe. A place to create fabulous visuals such as posters, social media posts, video stories and webpages. Easy tool to use and create impressive visuals. A great place to look for stimulus for student work. This website takes in questions from their community and creates visual imagery that gets you thinking. Mindless fun for anyone. Can you draw clearly and fast enough that the programme can guess your image? Recommended by ISTA staff member Tom Scott. Check out the latest in innovative products that haven’t yet hit the shelves. New ideas ready for purchase and backing – have the newest gadget or product before anyone else! Recommended by ISTA staff member Tom Scott. A humbling look at the earth and how it is impacted by humans and how it changes literally by the second. Have we missed any? Let us know any of your favourites that aren’t on here.